Some engineers just can’t wait until they graduate to start innovating. 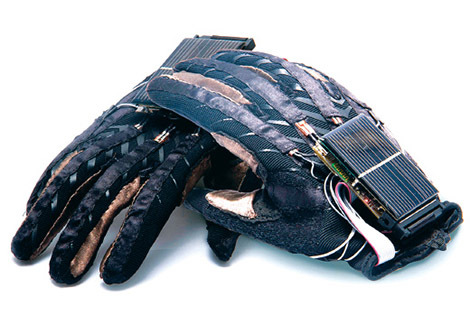 Here’s one recent example: After watching a man with a speech impairment struggle to make a supermarket cashier understand him, three Ukrainian computer science students, who call themselves the QuadSquad, designed gloves fitted with 15 sensors that can understand the hand and finger gestures used in sign language. Via a Bluetooth connection, the decoded movements are sent to a software program that translates the data into sound, allowing a synthesizer to voice the translation and broadcast it from a smartphone’s speakers. Earlier this year, QuadSquad beat out 350 students from 75 countries to win Microsoft’s $25,000 prize, the Imagine Cup. The EnableTalk, as the device is called, runs by a battery that can be recharged by a built-in solar cell or a USB port. QuadSquad hopes to sell it for around $75. For millions of people worldwide with speech or hearing impairments, EnableTalk could be a communications bonanza.